← 2012 Toyota Camry Earns NHTSA 5-Star Crash Rating!! 2012 Chevy Cruze Eco Astonishes With 42 MPG! As automotive journalists get their hands on the 2012 Chevy Cruze Eco, many are astonished by its fuel economy. The typical Cruze is altered on many levels to achieve such great fuel economy, but what’s more is the fact that Chevrolet did all this without the use of hybrid technology. The 2012 Cruze Eco packs all the punch of the typical Cruze and so much more, all for an equally amazing price of $19,245. 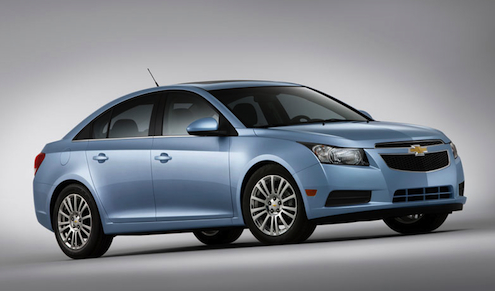 Autoblog – 2012 Chevrolet Cruze Eco: Is 42 MPG The Ultimate Answer to the Ultimate Question? Posted on January 4, 2012, in Automotive, Chevrolet and tagged 2012, Chevrolet, Chevy, Cruze, Eco, economic, economy, efficiency, efficient, fuel, Fuel-Economy, gas, mileage, MPG. Bookmark the permalink. 3 Comments. now you guys can drive to socal for about $100 in gas! I HAVE HAD SEVERAL COMPACTS FOR THE LAST 12 YEARS…..ALL WITH MANUAL TRANSMISSIONS……VW, SATURN, FORD. MY “12 CRUZE ECO(manual)” WHICH, I NOW HAVE HAD FOR 6 MONTHS, IS BY FAR THE BEST OF THE BUNCH. THE MILEAGE IS TRULY UNBELIEVABLE……got an even 50 mpg heading south on I-75 for 175 miles here in MI, cruise control set at 74. I HAVE ALWAYS HAD MANUALS IN MY SMALL CARS AND THE TRANS IN THE CRUZE IS EXCEPTIONAL……fun to drive and super smooth! MOST EVERYTHING ELSE ON MY CRUISE IS GREAT AS WELL…….seats, trim, radio/cd/mp3 player, trunk, exterior look w/the super cool “eco wheels”, driver info system and much more. ALL IN ALL, JUST A GREAT CAR…………..i look forward to driving it every time that i start it up!!! Thanks for the comment, Larry! Glad to hear you’re loving your new Cruze – it’s a great car!